NEXT | Can you make a Super Hole in One? 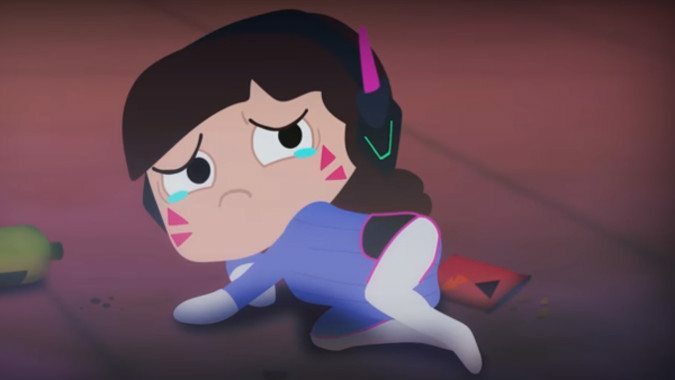 Before we get to this hilarious video from the folks at 64 Bits, you need to already know about the “Gremlin D.Va” meme. In Overwatch, D.Va is (among many other things) a professional StarCraft player. The Gremlin D.Va meme basically says, “Okay, if she’s a pro gamer, let’s dogpile on all the gamer stereotypes at once” and takes it to ridiculous comedic effect. So instead of the cool, poised D.Va we’re familiar from matches where she blows you up with her MEKA and takes a selfie of it while you die, you get something else — a tiny, angry, chips-and-super-high-caffeine-soda-consuming rage gamer. In much of the fan art for this characterization of D.Va, she’s paired with Soldier: 76, because he’s essentially thrust into the role of ‘Dad’ — or ‘Grandad’ — for many Overwatch characters in the fandom. Look, Overwatch has built up its own mythos in just one year, you need to learn to accept it.